I'm not sure what Yall do but I Paint on the insignia that is given unless it is to small but thats only because i'm not sure how to get the decals on correctly i've always had triouble doing this since i was 5 and started building models any thoughts ideas or questions? I wish I had the eyes and hands needed to paint markings. Actually, I'll bet they look better than decals. You should post some pictures of your work. What exactly does the water/glue solution do? Does it make the decal blend better with a dull surface, like on a tank? So this is what I do: I outline the decals very lightly with a pointed pencil and just follow the lines with paint (usually with a pointed toothpick)... it worked very well so far for rather simple insignia. But I have looked at Eduards painting masks, pretty intresting idea/concept I think. As far as I know the tips that Ron pointed is most eficient method to use, I do it (more or less ) and I would recommend it. What would life be like with those... I'm still waiting to find out.. These two setting solutions are pretty good for difficult to work with decals - i.e. decals too thick to settle down over curves and details - or older decals that have lost their "bite" and the glue won't hold them down. 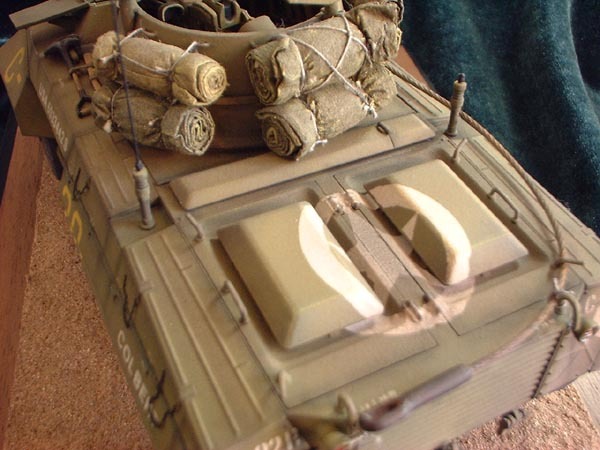 The decals for "Double Dare" on my M20 Armored Utility Car were really nice SuperScale Decals, but I had a difficult time getting them to settle down over the strengthening ribbing on the sheet metal of the M20 fender skirts. The decal solution allowed me to get them to adhere properly. The National Insignia on my M8 Armored Car "Colbert" is a Verlinden dry-transfer. It is the most difficult application of a dry-transfer I've ever tried - and I won't do it again. You can work them around complex curves like the engine breather deck of the M8 / M20, but the exercise will make you want to pull your wisdom teeth out. Here, a decal softening solution with a suitable water-slide decal would have been less headache. Why did I go the other way? It's easy to get goaded into Advanced Modelers Syndrome. Instead of purchasing a replacement set of decals, I went insane and used VP dry-transfers. Lesson here is not to make things tougher on yourself. It is best to gloss coat the area where you will be placing a decal. Less chance of air being caught under the decal, this leads to "silvering", If you have a difficult decal that just won't behave, use the diluted white glue mix. I will hold the decal in place. Then dull coat over and continue your weathering process. Gentlemen----I first used the gloss, micro set method with the Emhar 1/35 Whippet tank. They have a red and white marking for the front slope. Looks like it was painted on the vehicle. Became an instant believer and practitioner. 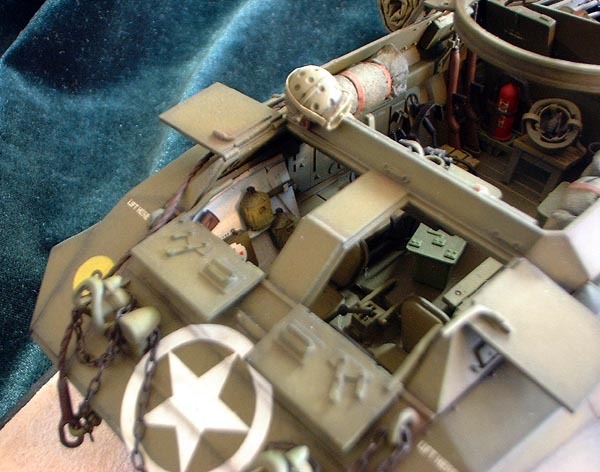 Now, what really has me curious is the method displayed in the Osprey book on WW II dioramas. In this book, they show several Churchill tanks attacking a German position in France. They then display various improvements done to the Tamiya models. The author sprayed national insignias and a red traingle inside a white circle with an airbrush. He used a contact paper to mask the surface (I think it was called "fiske or friske paper"). Now, the point here, how did he get the sticky paper off without damaging the base coat? Has anyone else seen the book? If so, have you tried the technique I crudely explained? DJ - frisket paper is a low-tack medium. If you're careful not to leave it on the surface of your model too long (too long = overnight, an hour or even two is okay) it won't mar the finish underneath. There are all brands available, I like the stuff I get from Art Stores, but Badger makes some good stuff too. Gunnie--so much to buy, so little time. Have you seen the Osprey Book? Did you use their technique? I'm at a loss for words at your pics on here! I may be converting to allied armor after all! More pics matey! No Sir - I haven't seen that Osprey release. Do you think it's worth getting? Thanks Marek! :-) I already told Paulo that I'd have to do something different before I got to 1000 posts - I went out and bought the OUTSTANDING AFV Club Sd.Kfz.11 3-ton Half-track. You guys are getting me interested in German WW II Armor - no small feat let me tell you! Corey, just remember DO NOT attempt to move the decal after using MicroSol. It WILL tear. Also, the MicroSol will make the decal wrinkle up, this is usual. The decal will flatten and conform as it dries. O.K. guys, was hanging around the thread where Gunnie was showing the pics of the incredible interior of his Stuart tank. Everyone was goo-goo about, as they should have been. BUT! Is it just me, or did you guys see, really see, the interior work on his M20 in the above pics? The top pic especially....unbelievable. I just recently bought a Tamiya M20 with plans to really super detail it. You know, the whole enchilada. But instead, I think I'm just going to throw it in the garbage! May as well! Naw Tread - don't do that :-) Tamiya's M20 is so cool - go buy another!! !